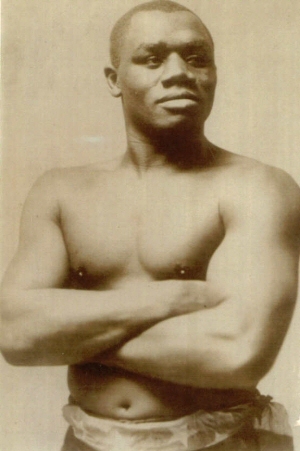 Sam Langford was one of the greatest fighters in boxing history. Born in Weymouth Falls, Nova Scotia on March 4, 1886, the 5’ 7” dynamo migrated to Boston, Massachusetts, and engaged in close to 300 officially recorded professional contests from 1902 to 1926. He was an exceptionally courageous and intelligent fighter with long arms and an impressive upper torso. He also packed a tremendous wallop in both hands and knocked out many of the much larger and talented boxers of his day. In 2003, Ring Magazine’s writers listed him second on their list of the 100 greatest pound for pound punchers of all-time. Jack Dempsey (as told to Bob Considine and Bill Slocum), Dempsey, By the Man Himself (New York: Simon and Schuster, 1960); Clay Moyle, Sam Langford: Boxing's Greatest Uncrowned Champion (Seattle: Bennett & Hastings, 2008).